I got this unsolicited email with the provocative header “You are featured in Yahoo News.” Well, it wasn’t about that, it was an inducement to write an article for some company about my research, with said company implying that they could place the article in Yahoo News. And the soliciting agency, “The Scientific News, Ltd.” is on LinkedIn as a “public relations and communications” firm. Why would they do this? Check out the PS! (I’ve put it in bold). I can’t imagine anything more duplicitous than a PR service soliciting science articles in a sneaky way and then expecting the scientist to PAY for this publicity. That’s not news; it’s advertisement! And it’s what predatory journals do. I suspect that nobody would buy the damn articles, anyway. This may well be a complete scam, but one thing is for sure: if Yahoo News is reputable, they wouldn’t take article from this source. I am Amy R. Fife, Editorial Assistant, The Scientific News Ltd., contacting you with the reference from our Editorial Board. As Yahoo! news receives millions of hits each day from a very broader audience including professionals and students, only a few exceptional researchers are selected and invited to submit their work, and you are invited! We are a specialist agency “Scientific News Ltd.” working within the research community to produce high-value, impactful communications content for researchers. This content is made available to a broad global audience and distributed to over 500+ premium news sites including Yahoo! News, Google News, WND, Bing News, Ask, CBS, CNN, Bloomberg & More, which also include key research community actors, research peers, government figures, funding agencies, policy makers, NGOs, charities, schools and libraries, investors and commercial entities, and many more. We can help you feature you and your research work in Yahoo! News, and other 500+ Premium news outlets. All we need is a news article specially written for Yahoo! by explaining in detail about your research in layman language and send it to us. If you want us to write the news article for you, just send us your articles, so that our editors can write about you and your work and will broadcast the same in Yahoo! News, and 500+ Premium News Channels. We believe that publishing with Yahoo! News will be of great value to you, and will help you reach your research with a worldwide recognition. It is going to impact your profession in a major way. Publishing enables us to collaborate and share ideas with, as well as learn from, the broader scientific community. As Yahoo! news and other 500+ associated News sites receive millions of hits each day from the very broader audience including professionals and students to the general public. You and your research can reach Millions Through Yahoo! News and 500+ Premium News Sites to increase your presence online and in the search. A News highlighting the successes and advancements made by you can be a great way to build trust and credibility in your field of Research. If you are interested in our proposal, just send us your articles or published article links, so that we can send you more details. Nothing is more important to us than the satisfaction of those we work with. I’m sure we will live up to your expectations. The package includes publishing in Yahoo! News along with 500+ major news outlets. PS: Standard Article Processing Chages [sic] Apply. Does Amy Fife exist? Who know? I can’t find her on the Internet. This entry was written by whyevolutionistrue and posted on February 6, 2019 at 9:30 am and filed under duplicity. Bookmark the permalink. Follow any comments here with the RSS feed for this post. Both comments and trackbacks are currently closed. If the quality of English in the letter is anything to go by, anything they submitted on your behalf would not enhance your reputation. Based on the quality of the writing, I wonder is Amy is related to Barney? If you go to this Linkedin site, the second listing down is an Amy Fife in London, who is in marketing. Whether she is the Amy Fife in question I don’t know. If you are a member of Linkedin, you can get more information about her. “I am based in Michael Spencers office” – Yep, looks like our Amy. Whenever someone says – You are invited, it is time to hit the door. Amy Half Life….. is that a pun? I doubt they can place stories in Yahoo News, Google News, or most of the others in that list. Rather, I suspect that they issue press releases, and some news outlets might bite. (Of course, they might not bite, given the poor writing on offer, as evidenced by the letter of solicitation.) University press offices do this all the time. The difference here is that they want individual scientists to pay the PR release writer. The company is indeed listed at Companies House, the UK registry of limited companies. The 160 City Road address is the registered office, and their business is listed as “Public relations and communications activities”. 160 City Road is an office block in the City of London, so I’m guessing it’s actually a mailbox. AFIK It can’t be a mailbox under company law, however, it can be an ‘agent’… ever since the registered adress has allowed HMRC to come in more or less as they please, there has been a tendency for registered offices to be allocated to agents (often legal representatives). From the people who brought us predatory journals and bogus conferences, I’d think. You pay them. they send out your article to their list of 500 outlets, all of whom ignore it because they have no standing. Vanity publishing without the publishing. Disclosure: I have been featured in Yahoo News and did get a lot of hits. But Yahoo News picked up the article they featured themselves from The Conversation, whch is I think one of the few outlets for which Jerry has also written without payment. I absolutely can’t stand “Processing Chages”. They bite, and scratch and itch! 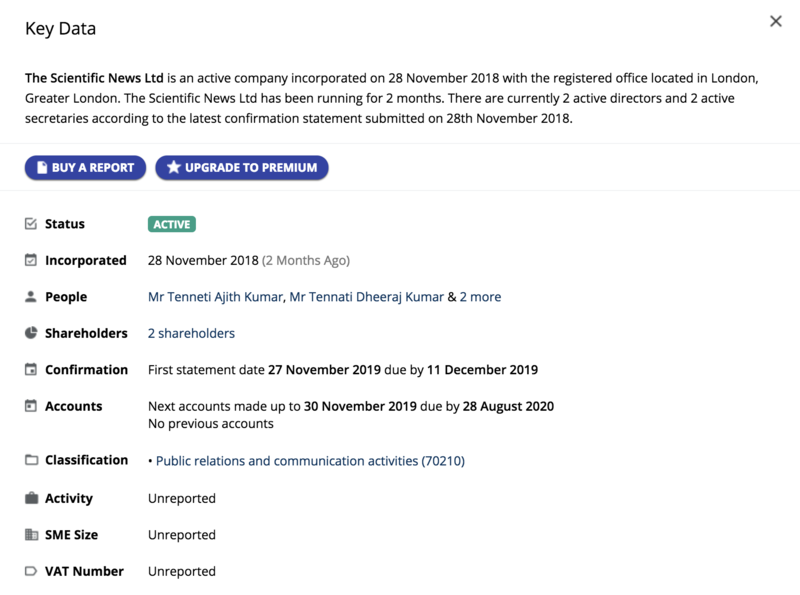 Their other biz in Rajahmundry [AND E-Commerce Private Ltd] is based out of the same undistinguished domestic address as The Scientific News Ltd. I can’t tell if this is the same outfit or not (it’s a rather generic name), but “thescientificnews.com” looks like a scam. It has article titles that look they could be genuine science articles, such as “Experimental Stem Cell Injection Reverses Osteoporosis in Mice” or “A Lot of Lives Lost after Common Heart Procedure”, but all written by that well known journalist “xsoP7Vmeq1”. Both articles, supposedly written 30th Oct 2018 (the earliest on the site) turned out to be copies of this 2016 Medical News Today article about sugar in the diet, and the same goes for perhaps 100 similar bogus ‘articles’ put on the site that day. More recent articles read like they’ve been through machine translation. They also tend to feature Chinese scientists. Whether those scientists have any idea their research has been use,d I’ve no idea; it might be that they’re the market the company is aiming for – “we’ll give you international exposure” – or it could just be that the company can escape plagiarism charges by running stolen articles through translation. Oddly, the same day I got an invite to pay to submit an article to (I think, I’ve spam-canned the mail) scientificsociety.xyz ; is there a significant increase in these things, and does anyone have an idea why, if that is the case? Obviously, I will treat any “.xyz” domain with even more suspicion now than previously – and previously it would have triggered my “spammy sense” anyway. Which *tries* to look as if it’s from my domain registrar. It ain’t. I suppose these pathetic scum think including that turns it from a con into a legal offer of ‘services’.